They consist of a strand of nucleotides with a phosphate group, a 5′ sugar and a nitrogenous base. DNA and RNA molecules are polymers. 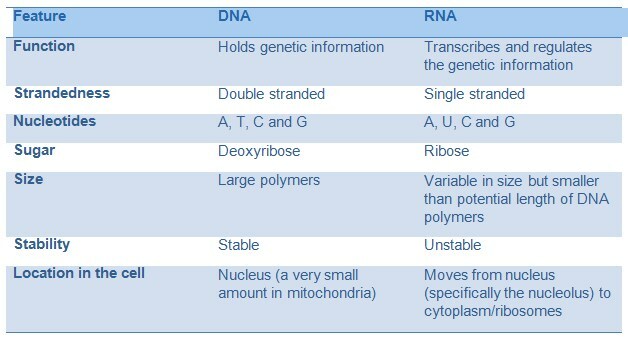 DNA is double stranded, whereas RNA is single stranded. Various types of RNA exist which have roles in protein synthesis as well as regulation of cellular programmes by fine-tuning gene expression. Nucleic acid is a term covering both DNA and RNA molecules, the key macromolecules for the coninuation of life. DNA and RNA similar, and both store and transmit critical information. However, they do have some stark differences, allowing them to perform distinct functions within the cell. The key differences are in the sugar in their sugar phosphate backbone, the RNA-specific substitution of the nucleotide Thymine with Uracil, and the fact that RNA is usually single stranded, whereas DNA molecules are double stranded. 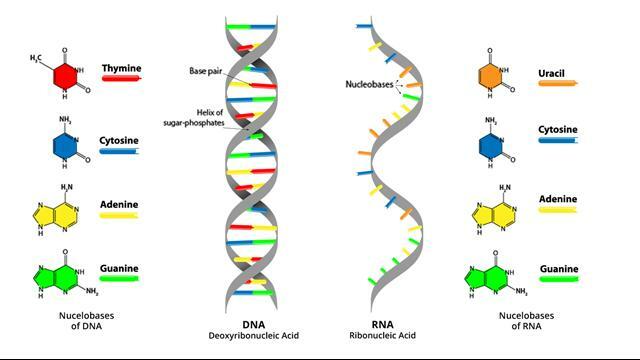 Nucleic acids are long chains (polymers) created by the joining of monomers, which are the nucleotides. Nucleotides are therefore the building blocks of a nucleic acid. They are small molecules composed of 3 subunits: a nitrogenous base, a five carbon sugar and a phosphate group. The sequence of these nucleotides (A, T/U, C or G) along the polymer of DNA or RNA determines the meaning of the instructions held within. Because genes are thousands of nucleotides long, there is an endless number of sequences that can be generated, all encoding different amino acid sequences and carrying out different functions in the cell.To create the DNA/RNA polymer, the nucleotide monomers must link together, forming a strin of nucleotides. The nucleotides come together through a bond called a phosphodiester linkage. 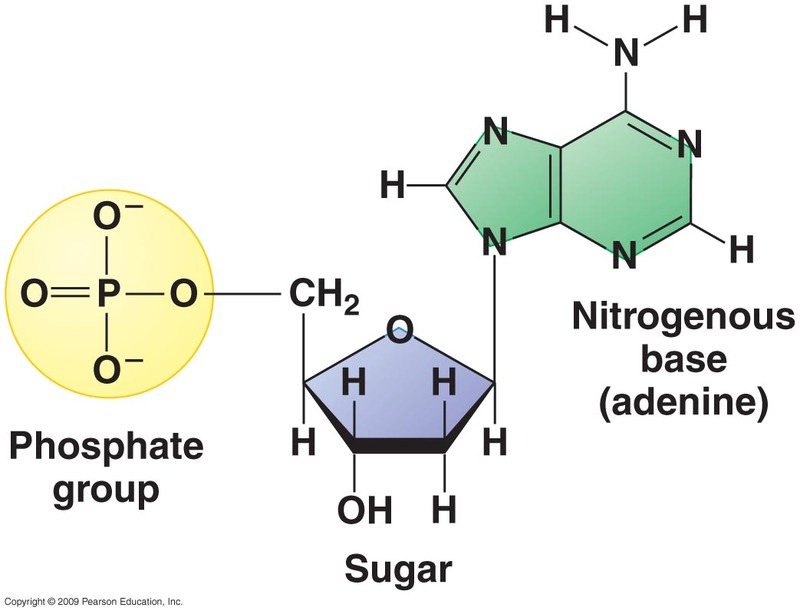 The phosphate group of one nucleotide attaches to the sugar of another nucleotide. Specifically, it attaches to the third carbon molecule in the sugar (also written as the 3′ carbon). Through this pattern, the monomers come together to form a polymer called the sugar-phosphate backbone. RNA molecules consist of a single strand of these nucleotides. In contrast, DNA forms a unique structure – a double helix. The double helix consists of the two strands wrapping around each other, connected in the centre between the two backbones. This occurs through a phenomenon called base pairing, which involves the pairing of the nitrogenous bases in the centre. These bases join together with a hydrogen bond. Base pairing rules means only certain bases are complementary to one another. A always pairs with T, and C always pairs with G. This is because these particular pairs fit exactly to form effective hydrogen bonds with one another, holding the two strands together. The two DNA strands in the helix are complementary, so if we know that one strand contains the sequence ACTGA, the paired strand would read TGACT. Thus, each DNA strand can serve as a template for its own replication, as all the information to form a complete DNA molecule is held in one of the strands. Whilst DNA has the primary role of holding the genetic information in the cell, RNAs have more diverse functions. As previously described, they can transmit messages from DNA to the protein synthesis machineries (mRNA), but they can also be regulatory RNAs, ribosomal RNA (rRNA) and transfer RNAs (tRNA). mRNA is an intermediate between a protein-coding gene and its amino acid sequence. The mRNA. carries the same information as the DNA sequence of its gene. However, in the RNA molecule, the base T is replaced with U. The mRNA then leaves the nucleus and enters the cytoplasm, where a ribosome uses the sequence of the mRNA to make a corresponding amino acid sequence. Other types of RNA in the cells have distinct features from mRNA. Ribosomal RNAs (rRNAs) form complex secondary structures, and are a major structural and functional component of ribosomes. In the ribosome, they they help mRNAs to position correctly, so that its sequence information can be read and processed. They are also unique in that they are encoded and transcribed from DNA in the nucleolus, the large dark structure in the nucleus. Transfer RNAs (tRNAs) have a distinct role in protein synthesis, where they bring the relevant amino acids to the ribsosome during the translation of an mRNA molecule. tRNAs also possess a unique structure, with its secondary structure appearing like a cloverleaf shape, and its 3D structure forming an L-like shape to fit into their required sites in the ribosome. Some genes code for non-coding RNAs that do not encode proteins, that help regulate the expression of other genes. These are often called regulatory RNAs. An example of such a class of RNA are microRNAs (miRNAs). miRNAs are small molecules (they only consist of around 22 nucleotides) and their main job is to silence genes, by interfering with mRNAs after they have been transcribed. They do this by binding to specific mRNA molecules and altering their stability or interfering with their translation. This gives the cell another mechanism of fine-tuning the expression of a gene, through editing the information post-transcriptionally.